Leveraging on our state-of-the-art procassing unit, we are able to formulate 2-Chloro-4-Methoxyphenylacetic Acids that are extensively used in various research institutes and industries for different applications. We use quality material for processing these acids that meet international quality standards and norms. Moreover, we can also process these acids as per the requirements of our clients. Backed by 15 years of industry experience, we are an ISO 9001:2008 certified organizations engaged in offering a fine range of Chemical compounds. Our range comprises 2, 5-dimethoxyphenylacetic acid, 2',4'-dibromophenol, 3-cyano coumarin, 3-chlorocoumarin, 5-hydroxyflavone and 4-nitroveratrole. 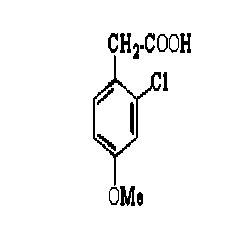 we also offer to our client’s 4-phenoxybenzoic acid-phenoxybenzonitrile, 3-iodobenzamide, 6-nitrochromone, 6-methylchromone and 6-chloro-7-methylchromone. These products are accurately processed by our professionals using high-grade ingredients. Complying with the prevailing international standards, these products are acknowledged for features like purity, effectiveness, accurate composition and precise pH value. Owing to our robust infrastructure, we have been able to come up with a superior range of products. We have all the requisite machines and advanced technology for making exceptional quality chemicals as per the specific requirements of our valued clients. Due to our focus on delivering quality products, we have been able to satisfy our clients based in East Europe, East Asia, Middle East, South America, South/West Europe and North America.